Conservative commentator Charles Krauthammer said after Thursday night's Fox News Republican debate that former Florida Gov. Jeb Bush (R) might have come away a big winner. Speaking with Fox moderator Megyn Kelly shortly after the debate ended, Krauthammer said the former Florida governor turned in a strong performance — possibly the best of the night out of all the candidates on stage. "I thought it was, interestingly, the best night that Jeb had in all of the debates," Krauthammer said. "And I might even say I think he might have had the best night of the group in this debate." Krauthammer highlighted one moment with presidential rival and Sen. Marco Rubio (R-Florida). "He was very strong. He had one moment where he kind of flipped back to Marco Rubio on the question of immigration," he said. Krauthammer was referring to a back-and-forth between Bush and Rubio on supporting a path to citizenship on for immigrants living in the country illegally. Rubio said that Bush used to support a path to citizenship — to which Bush said, "So did you." Bush then continued: "I think it's important for people in elected office to try to force consensus to solve problems. There's never going to be a perfect bill. ... You shouldn't cut and run. You should stick with it. ... He cut and run." He was referring to the 2013 immigration bill that Rubio co-sponsored. MARCO: We need to arrange the Titanic deck chairs numerically. JEB! : No Marco, we need to arrange the Titanic's deck chairs alphabetically. And you used to say the same thing. Btw, what's the deal with the water at my feet? "Charles Krauthammer said after Thursday night's Fox News Republican debate that former Florida Gov. Jeb Bush (R) might have come away a big winner." Sure he has ........Drudge poll has Bush at - td da - 1.09%. Krauthammer has HATED Trump from the very beginning. Trump's success has made him bitter, even more bitter I should say. Obviously Krauthammer is a Bush man looking for any ray of hope! 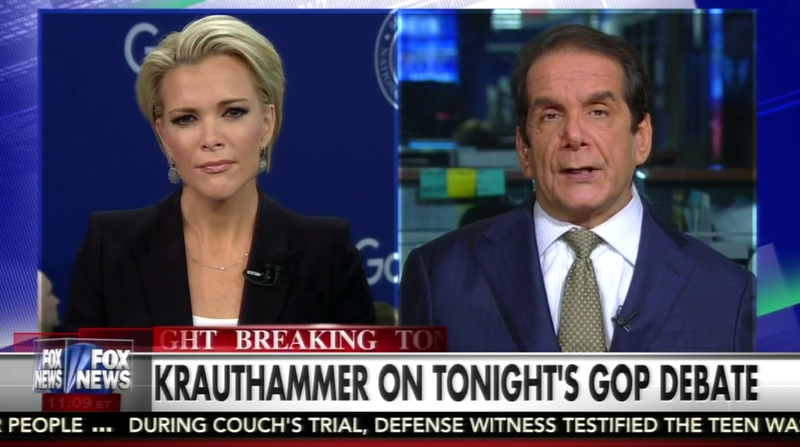 Btw, did anyone see the handler's arm reaching in and adjusting Krauthammer's tie AFTER the camera was on him? I'd love a gif of that!!!! Sweden may reject thousands of asylum applications » « Hillary’s E-mail Scandal Is Criminal; When Will She Get Her Handcuffs?